What the hell Memebox?! That's not cool!! There was no info card in the box and you deleted the set from your website! How am I supposed to figure out what each of the items are and how to use them all?! I don't have photographic memory!!! Urg! 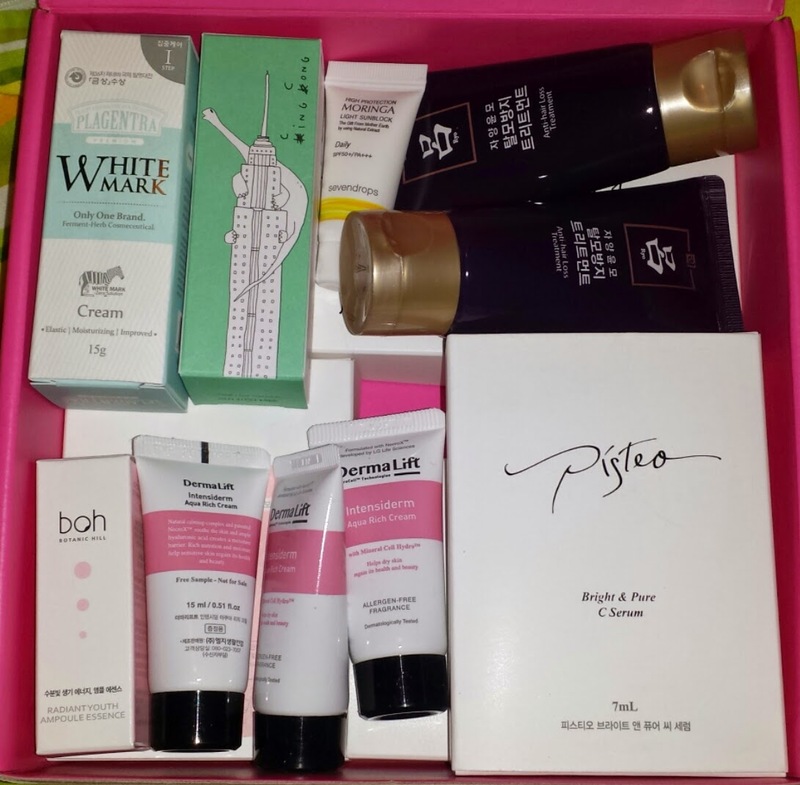 Luckily, Unboxing Beauty managed to find a picture of all the items so I was able to grab all the product descriptions. Aside from the lack of info card, this was a very good box! It was $15 including shipping for all of these samples. Product Description: Made with 100% Vitamin C, this tiny bottle full of nutrients will replenish moisture balance, firm up fine wrinkles, and brighten overall complexion with continual use. Use it for 7 days to see wrinkles, dark spots, and sagging noticeably improve. Thoughts: I already received this in one of the Thanksgiving box. It was the product that made me instantly went and grabbed box! Why you ask? Well, even though this a sample size, Memebox included 5 of them. Yes, 5 of them! Considering the full size is 4 bottles at 87,000 won ($100 CAD). This was a STEAL! It's a steal only if it works right? Well I haven't used mine from the Thanksgiving box yet but other bloggers tried it and said it really did have a good effect. So I couldn't pass up on this deal! 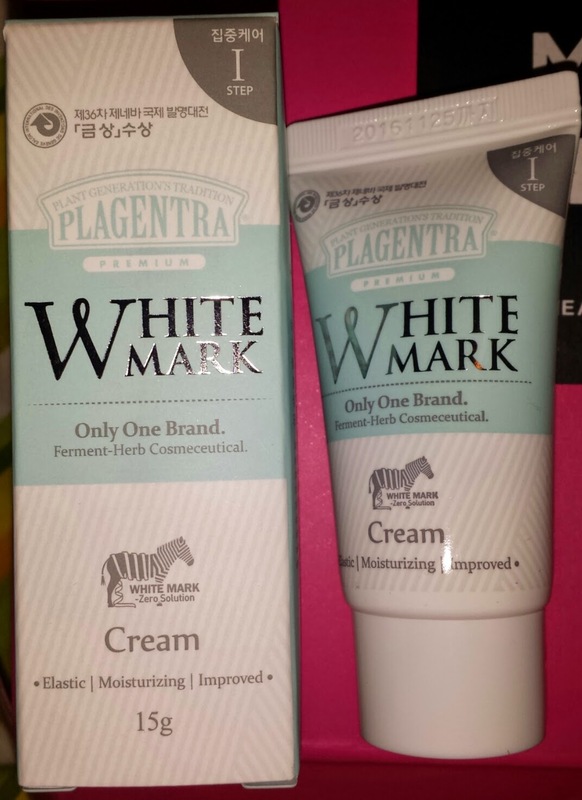 Product Description: White Mark Cream is an innovative, highly targeted treatment that helps to reduce the unsightly and embarassing appearance of stretch marks, caused by rapid weight loss, pregnancy, and more. It hydrates and firms the skin for long-lasting youth. Thoughts: So this is primarily for stretch marks. I do have some so I will try them but it's a pretty small sample that I doubt I will see any results before it runs out. Product Description: This gentle, moisture-rich facial cream is formulated specifically to soothe and repair damaged skin without irritating the skin with a protective moisture barrier. 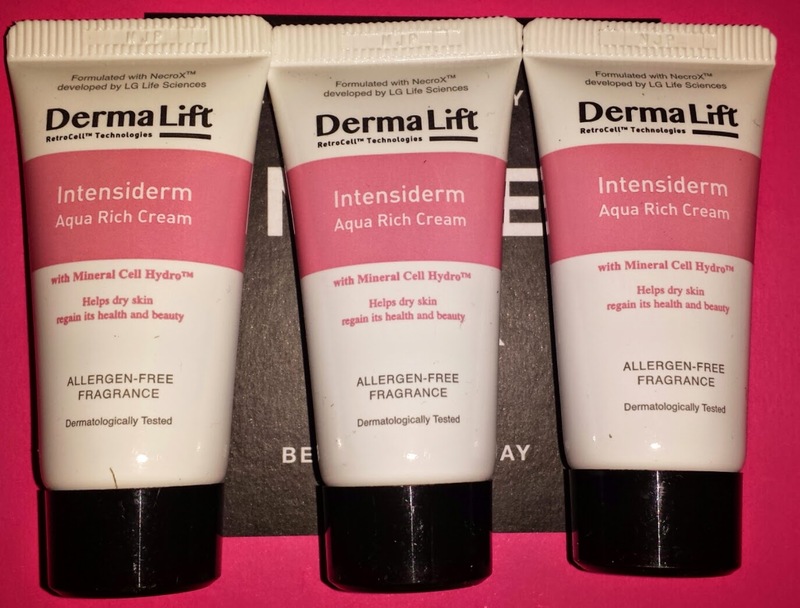 Deeply replenish and nourish the skin this cold season with Derma Life Intensiderm Aqua Rich Cream! 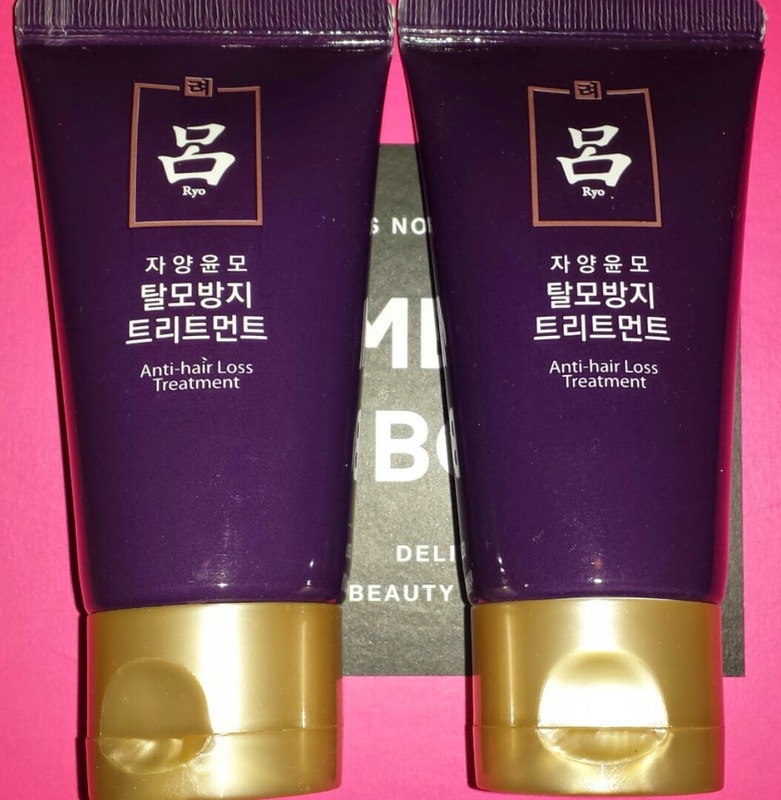 Thoughts: I was convinced I need to try this product after reading Fanserviced's review on them. 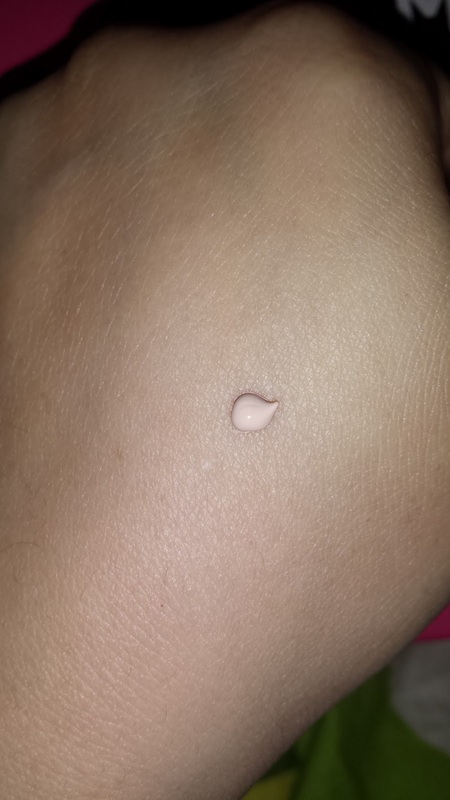 She has shown that the creams are good at keeping the moisture in. Can't wait to try these! Plus, they are little tubes so I can carry them in my bag instead of the huge tube of cream from Moisture Surge. 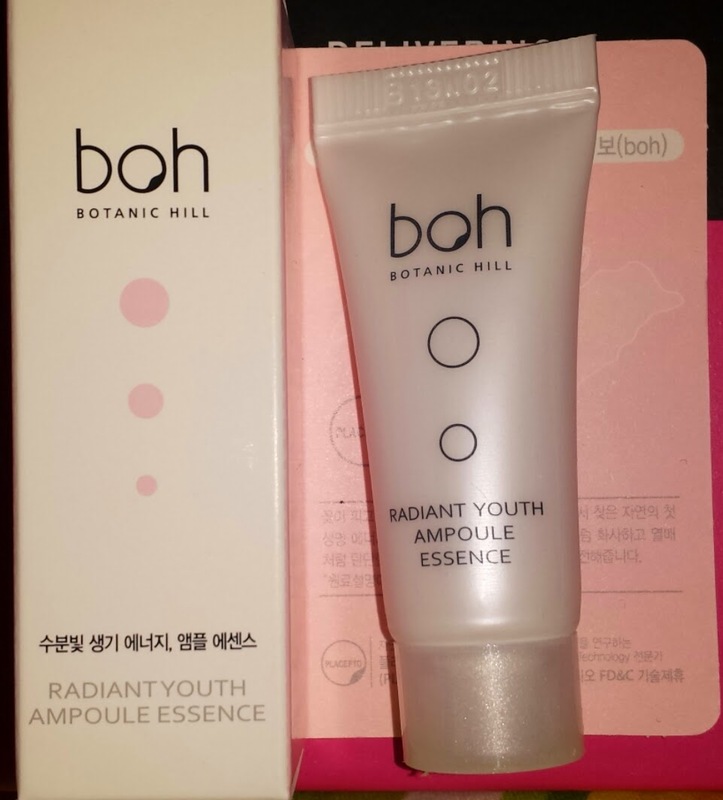 Product Description: Botanic Hill's most loved Boh Radiant Youth Ampoule Essence is a thick brightening and age-delaying serum that combines an ampoule, essence, and serum, all-in-one! It gives a moisture boost to the skin for a youthful and radiant glow and rejuvenates dull, and ruddy complexions for an overall smooth look. Thoughts: This is also a tiny sample. I don't know if I will use it. But it would be great to have a tiny ampoule for travelling instead of my huge bottle. This was in an older box before so I am wondering about the expiration date. Product Description: Ryu's Anti-Hair Loss Treatment shampoo is specifically designed for those who are experiencing general thinness at the crown of the head. The specialized herbal extract formulation strengthens hair from the roots, prevent breakage, and condition hair strands, promoting a full, lush locks. Thoughts: I wanted to try this since I saw some reviews on this shampoo. I have really thin and soft hair that continues to fall out like crazy. So I can't wait to give this shampoo a try. Edit: These are small tube but they last a while. The first time I used it I thought it was a shampoo so I used it in place of a shampoo. Of course it didn't foam up and my hair was oily afterwards. After I figured out this is a treatment and used it during the conditioning stage, I no longer has oily hair.. :P This tube has lasted me for 2+ weeks, used every other day. I use about a quarter sized each time and just rub it into my scalp. I have noticed my dry scalp is not as dry as before, and my hair looks thicker than it used to be. Yay! Now that someone requested them on Testerkorea, I can buy more after I finish the samples! Product Description: This fast-absorbing, ultra-lightweight fluid provides daily protection against broad-spectrum UVA/UVB damage. miraculous morniga tree extract combines with antioxidant-rich nutrients and UVA/UVB protecting actives to delay signs of aging caused by sun and environmental stressors. The sheer formula has a silky texture and weightless feel, designed to apply smoothly on top of other skincare products and under makeup for a soft, matte finish. Product Description: This color-correcting cream fades imperfections, evens out the complexion, and prevents future discoloration by delivering vital nutrients and hydrating to the skin. It also primes, perfects and protects the skin from sun damage, as well as brightening up the entire complexion for a naturally, radiant glow. The results? 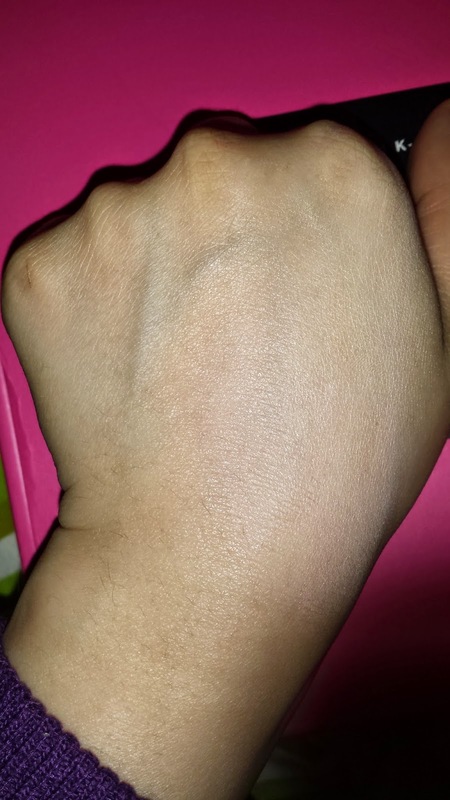 Skin is bright, glowing, and smooth to the touch! Thoughts: This is a cute design! I really like the side drawing. It's adorable. I was skeptic if it will match my skin tone, since I only have found one BB/CC cream to match me. So colour me surprised when I applied it and it actually matched! Well.. I guess it is a little light for me but it blended in pretty good. 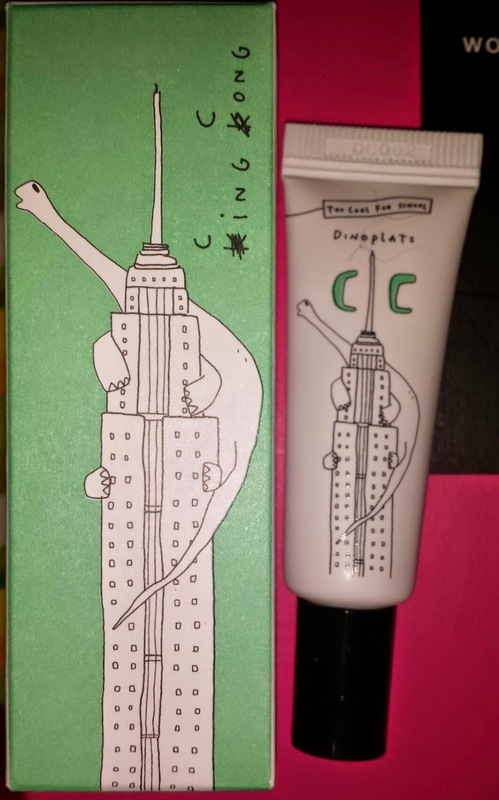 Contemplating if I want to keep it or give it to my friend who likes the packaging and is a similar shade. Product Description: This versatile cute as it is useful. (I think some words need to be added) Stay organized with the mesh design that allows you to easily peer in at the makeup and accessories inside. It's just the right size for holding your favourite hair, face, and body products at home, in your desk, or at the gym. 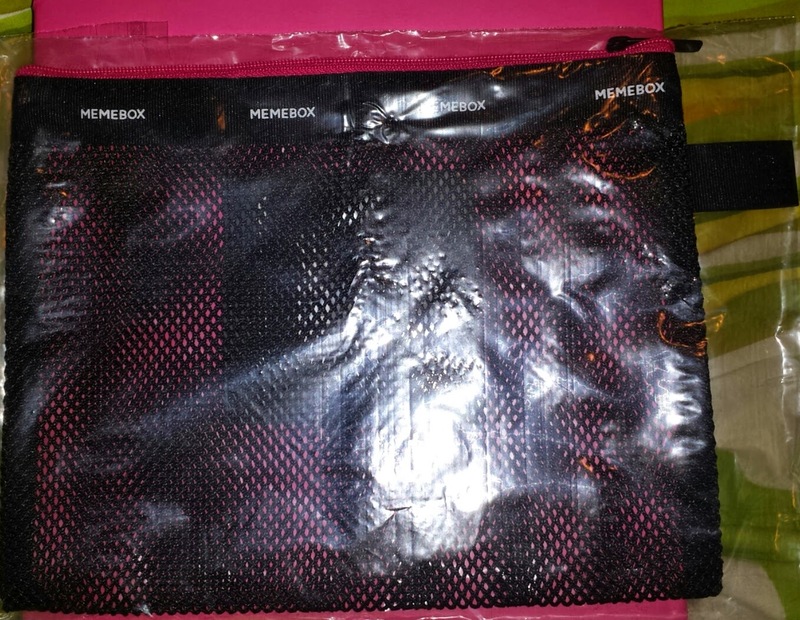 Thoughts: I think this was the pouch that was advertised to be in the Memepouch box before but was not included. It's a nice product to have, especially for travelling. Overall Thoughts: This was a pretty good last Memebox. It was cheap, and contained two samples I wanted to try. It also contains quite a bit of the Pisteo Vitamin C serum! Very glad I picked up this box as my very last Memebox.